I saw this recipe on the front page of Kraft Foods and it looked too good to pass up. -CUT thin slice off top of garlic; discard top. Place garlic on sheet of foil; drizzle with oil. Wrap loosely with foil. Prick potatoes in several places with fork. Bake potatoes and garlic 1 hour. -REDUCE oven temperature to 350ºF. Cut small slice off both ends of each potato. Cut potatoes crosswise in half. Scoop out centers, leaving 1/8-inch-thick shells. Place potato flesh in medium bowl; mash. Squeeze garlic out of papery shell into bowl with potatoes. Add sour cream, 3/4 of the VELVEETA and Parmesan; beat until fluffy. Spoon into shells, mounding filling as necessary; place in shallow baking dish. -BAKE 30 min. ; top with remaining VELVEETA. Bake 5 min. or until melted. Sprinkle with bacon. Oh these look amazing. 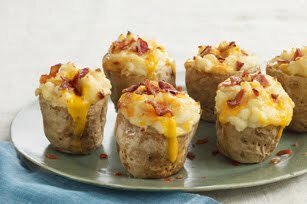 Of all the ways I love potatoes, baked is my fave. Oh Wow! Those look so good!